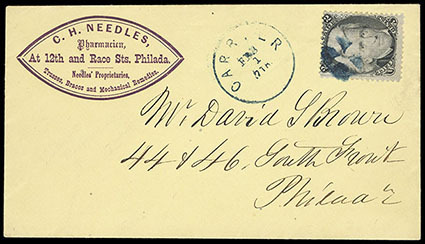 1867, 2¢ black, F. grill, tied by dark blue quartered cork duplexed with "Carrier '4th', Feb 1" cds on yellow cover to local street address, purple "C.H. Needles, Pharmacian" oval corner card, an Extremely Fine generally use, ex-Bleuler. 1867, 2¢ black, F. grill, tied by NYFM circle of wedges killer on undated newspaper wrapper from the New York Le Messager Franco-Americaine to the Paris publisher of the journal La Patrie, bearing red "15c" centimes postage due handstamp, Very Fine. Scott No. 93 Estimate $150 - 200. 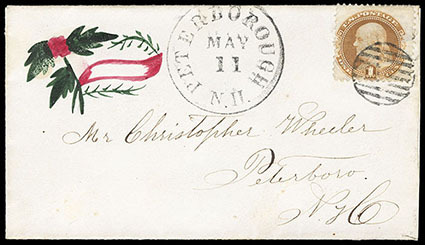 1869, 1¢ buff, neatly tied by grid handstamp on locally addressed small ladies cover, matching "Peterborough, N.H., May 11" cds and hand-painted red and green floral design at left, Very Fine, a very attractive usage. Scott No. 112 Estimate $200 - 300. 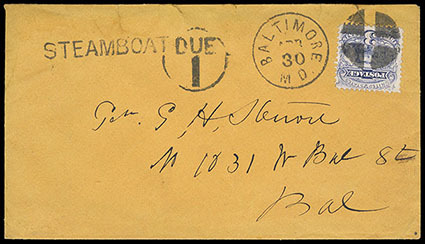 1869, 3¢ ultramarine, tied by "Baltimore, Md., Apr 30" cds and quartered cork duplex on incoming cover, with "Steamboat" straight line and "Due 1" in circle handstamps applied upon arrival; cover with small sealed opening tears at top, otherwise Very Fine; with 2013 P.F. certificate. Scott No. 114 Estimate $250 - 350. 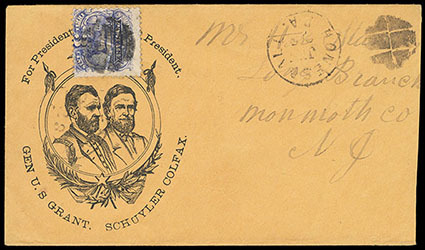 1869, 3¢ ultramarine, tied by "Honesdale, Pa., Jun 28" cds and cork duplex with second strike at right on cover with Ulysses Grant & Schuyler Colfax framed dual portrait campaign design with captions and patriotic symbols; cover slightly reduced at right, Very Fine, a rare 1868 campaign design. Milgram No. UG-44. Scott No. 114 Estimate $200 - 300. 1869, 10¢ yellow, large margins, tied by neat "N. York Steamship" cds on incoming cover to Pottsville, Pa., with original lenghty enclosure written aboard the flagship Lancaster at Montevideo, Uruguay, Extremely Fine, a rare usage from Uruguay; with 2018 P.F. certificate. Scott No. 116 Estimate $750 - 1,000. 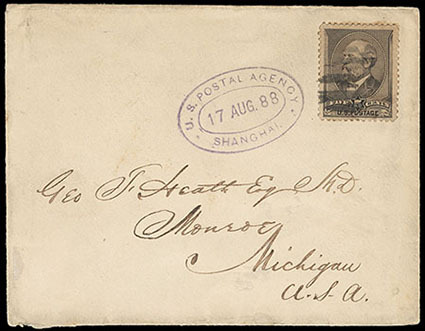 1873, 10¢ brown, in combination with 1873, 2¢ brown + 3¢ green, horizontal strip of three on cover to Sealkote, India, tied by target handstamps with matching "North Shenango, Pa., Jul 18" cds alongside, red New York and London transit cds's, cover forwarded to Dharamsala with numerous transit backstamps; right 3¢ with diagonal tear at top, Very Fine; with 2016 P.F. certificate. Scott No. 161+157+158 Estimate $200 - 300. 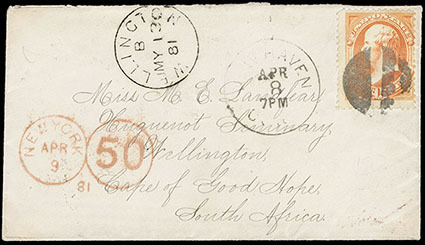 1873, 15¢ yellow orange, tied by "New Haven, Con., Apr 8" cds and cork duplex on cover to Wellington, South Africa, red "New York, Apr 9, 81 / 50" cds and rate duplex and receiving postmark at top, appropriate transit backstamps, Very Fine. Scott No. 163 Estimate $200 - 300. 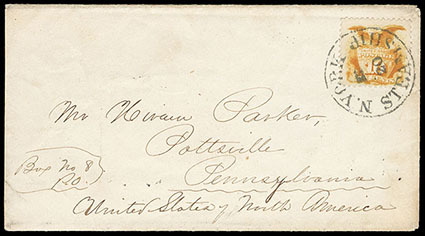 1882, 5¢ yellow brown, tied by small grid handstamp on cover to Monroe, Mich., with neat clear purple "U.S. Postal Agency, Shanghai, 17 Aug. 88" oval date stamp alongside, San Francisco transit and receiving backstamps, Very Fine. Scott No. 205 Estimate $200 - 300. 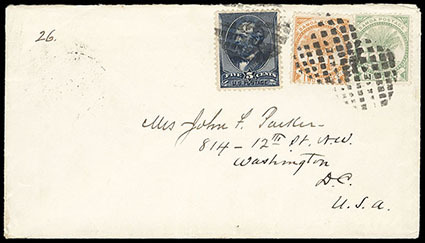 1888, 5¢ indigo, used in combination with Samoa, 1890, Palms, 1d green, 2d brown orange (11a, 13a), bright colors, all tied by three strikes of circular waffle grid cancel on 1888 cover to Washington D.C., light strike of magenta "San Francisco Paid All Aug 4" cds and Washington D.C. Aug. 10th receiving backstamps, manuscript "26" correspondence notation, Very Fine and choice, Odenweller Census No. 287; with 2016 P.F. certificate. Scott No. 216 Estimate $1,000 - 1,500. 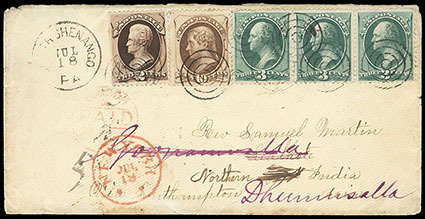 A RARE AND ATTRACTIVE UNITED STATES AND SAMOA MIXED FRANKING. Illustrated in Odenweller's Samoa book on page 210 (Fig. 21.3). The Odenweller book notes that the grids tying the Samoa and U.S. stamps are different, but they are identical and were applied to all three stamps upon arrival in San Francisco.